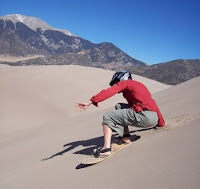 Sandboarding and California Peak near disasters! It looked like another nice weekend coming up in Colorado high country. "You up for something epic this weekend?" I asked Ben. "Sure...how about boarding the Sand Dunes?" And clearly the best. We found the park to be uncrowded and gorgeous, with perfect weather and ample camping. But I'm skipping ahead. In addition to the Sand Dunes, we planned on hiking California Peak, which promised a long class-2 ridge traverse up a 13.8k foot mountain. That seemed like a good combination for a Sunday with little chance of rain or clouds. Besides Ben, we piqued interest from his friend Sean, who was up for some sort of camping and outdoor adventure. We left Fort Collins just after 3AM on Saturday. Instead of using Ben's old snowboard, he found a place that rented sandboards and sleds in Alamosa. Score! Plus, they agreed to drop off the goods near the NP entrance by 9AM, saving us the extra trip. Double score! Except we were. Ben passed a stopped car to the left. From my sideview, I saw the car pull onto the road and start following us. "Uh, did you see a cop back there?" I asked, which turned out to be the magic phrase to turn red and blue blinking lots on the car behind us. This was the area approaching downtown where the speed drops down to 55, and we had no excuse. We were anxious and highly sober, unlike most of the other drivers at that time, but no dice. As a college student especially, that's the last thing Ben wanted. I couldn't tell if mentioning my previous tickets were helpful (Wisconsin...Wisconsin...Minnesota...California...Colorado), plus my lame parking ticket from Denver just a week earlier, or if we should drop the subject, but we did agree, unfortunately, that Colorado is pretty darn expensive. Soon Ben was out of that funk, and dawn was breaking. Finally, we left I-25 and started heading West. We were still early, somewhat hungry, and after we passed a coffee shop in Ft. Garland, I asked if he didn't mind stopping there: both of my travel mugs were empty, my bladder was full, and we were early anyway. He pulled a U-turn, and we parked at Ute Creek Coffee House. I'm a sucker for coffee houses. It turns out that the owner, John, is too, as he shared various stories about his background and starting the coffee house itself. "Well, to make a long story short..." he was fond of saying, and the twinkle in his eye proved that he was aware of the irony. We had time to listen to these stories while waiting for our made-from-scratch burritos. That's right, we glanced at the menu, saw burritos for $2.75, and asked about the ingredients. John's full-time worker (a nice 20-year old girl whose name we all remembered differently...Violet? Clarissa? Twilight?) told us we could have whatever we wanted in them. Sold! While waiting, John told us about the various pennants and signs hanging in the coffee house, which were all delivered or sent by various customers. "When I talk to somebody," he explained, "I can usually tell that they'll visit again. The only hard thing is getting them in the first time." I asked if they had any stickers, as I've collected them from my favorite shops. "No, but that's a great idea!" I'll be back again, to Ute Creek Coffee House in Ft. Garland., to check. Caffeinated, we were now on schedule to get to "The Oasis" just outside to pick up our boards. As we headed North, our view shifted dramatically. First, the last stretch of road is road-bike wet-dream smooth. Second, the view of the Sand Dunes is incredible. It just doesn't make sense: a vast playground of sand, piled between mountains and the San Luis Valley. With our boards in tow, we drove the car as far North as we could, to the "Point of No Return," and headed West to the Dunes. Basically, our plan was to practice on a bunny hill, head for steeper ground, and hit whatever looked fun. Things went exactly according to plan. Once past the initial scrub and brush, it was an entire day spent barefoot. At our first bunny hill, we tested out the gear. We were told to wax on every ride, and this ended up being good advice. The boards barely moved when unwaxed, especially on gentle slopes (between "Green" and "Blue" for major Colorado slopes), but absolutely flew when waxed appropriately. In any case, we were tentative but had fun on our first few rides. Neither Sean nor I had snowboarded previously, so we were quite cautious. But we were ready for bigger hills. As I hit the bottom, I fell straight back. I know there's a brutal, bruising learning curve in snowboarding, but I landed on unforgiving ground. Make no mistake: a half inch of slideable sand is covering solid ground. Midwest ice would have been a blessing. For about 10 seconds, I was afraid of vomiting (or worse), or bleeding internally. I stood up, warily, waved "I'm OK" and trudged up the hill, and did a systems check. I knew I was bruised, and unsure if anything was broken, so I took it easy for a bit. But, opportunities abounded, and I could still walk, so we headed deeper into the dunes, finding a long, steeper run to the West. I stuffed an extra shirt and jacket into the back of my pants, and was good to go. After a few runs, my confidence was back, and started having fun again, as I was starting to be able to shift my weight in either direction. After a few rounds, a family started making it's way toward us. Again, they wanted to check it out and take some pictures. This time, it was a man and 3 smiling, adopted children from Moracco: a young boy and his two teenage brothers. We quickly offered our gear to them, and the teenagers each took a test run. The younger boy, then, took his turn, and delighted us by flying down with absolutely reckless abandon! Soon, they were off, and Ben had one more idea: sledding down head first. We were skeptical, but it turns out this was the key to record land speed descents. Now, late-afternoon, we called it a day, headed back to return the gear, and picked up some Tecate for the road. We asked the ranger for camping suggestions, and he gave us great advice on backpacking a couple miles from the lower Zapato Falls trailhead to the NF boundary. Then, in the morning, we would be that much closer to California Peak. We followed this advice, and although the Zapato Lake trail had several social trails branching from it, we found a great campsite before dusk. We gathered our food and combined it: Trader Joe's Jambalaya, plus Ben's fettucini and chicken in a pouch, ended up being awesome like camp food always is. We forgot to bring rope, so we hucked our food remainders into a distant tree and hoped for the best. We worked our way through most of the Tecate, and headed to sleep under thousands of visible stars and the Milky Way itself. Sunrise woke us up, and we packed up and stashed more of our gear. We continued heading NW along the trail, and then saw the official Wilderness Boundary sign. We crossed a few drainages, but some were completely dry, so it was difficult to determine where we were on the TI map, since the trail essentially involved crossing a few drainages between ridges, and then heading straight west on a less popular trail. The TI map, unfortunately, doesn't have sufficient resolution to show the various switchbacks we encountered, so we stayed on the main trail, figuring that the ridge to California would be obvious. Except it wasn't. Even though California hits nearly 14k feet, the surrounding 12-13k ridges prevent a clear view of it from the Zapato trail. Finally, it looked like we were in a valley to the West of Twin Peaks. At this point, the trail became icy in the trees, and it didn't make sense to go further. We encountered a woman who was returning from the lake, so we knew we were past the ridge to California. We decided to turn back, and scout at the area near the NF boundary for evidence of a different trail. However, after we turned around and stared at the ridge in front of us, Ben and I decided that we should be able to scramble straight up it, thereby saving time and distance of doubling back. Sean was OK heading back to camp to rest, so Ben and I figured we'd make it up the ridge, run up the peak, and head back in no time. Except we weren't. With more experience, perhaps, we would have realized that the steep angle of the ridge meant we couldn't see what was behind it -- which was even more loose and dangerous climbing, 5.3-5.4 in Ben's estimate. Now, I am not a climber by any means, but I enjoy reading and learning about the sport from others. One thing I really dig is the idea of the "flow," being so caught up in what you're doing that everything else is blocked from your mind. While I've found that in other sports, I can totally see how this really applies to climbing specifically, where you're in an absolutely committed survival mode. The "thing" up the ridge to our right was not as high as the ridge in front of us. That meant, instead of risking life and limb for California Peak, we were instead making our way up an unknown, unnamed ridge instead. We ambled to the nearest high point -- a pile of rocks -- took some pics, and assessed our situation. We were essentially on top of an unknown knife edge. Both sides were equally steep, but the North side, unsurprisingly, was snow and ice covered. Climbing this ridge -- a stupid mistake for which I take responsibility -- now left us with an unknown risk of where to proceed, and the possibility of getting cliffed out if we picked the wrong direction. We both did not want to descend our ascent route, so our best option was to gamble and follow the knife edge as low as we could, and then head down. It was slow going as we picked our way around boulders. We hit treeline again, but this only mean more obstacles in the way, as it was still mostly steep, loose rock. We had no choice but to start heading straight down, slowly. We came near a steep gully, and each choose a different side, so that numerous rocks sent downward wouldn't harm the other person. Eventually, our only choice was to finish up on the gully itself. There appeared to be about 4 cascades of downclimbing followed by narrow ledges, and the problem was, we couldn't actually see the last ledge. This was truly a test of faith, and Ben went first. Most of the time, I couldn't see him, but I could only hear occasional crashes of rock. Now that I was straight above him, I couldn't move at all: even a weight shift could launch a serious of rocks downward. Eventually, he reached a safe ledge, and called out. I made my way down slowly as well. At one point, I took off my pack and contemplated pitching it, but couldn't count on it stopping at the next ledge, so I put it back on. Each hold absolutely had to be tested, and the only reason some of them stayed is because I didn't put full weight on them. Not much more to say here, but eventually I made it down. I will admit, several times, I just wanted to sit there and cry. But there was no option. We shouldn't have been in this position. I shouldn't have misread the map, of course, and we shouldn't have climbed an unknown route in either direction without protective gear and full visibility of the route itself, if not more experience. It's tempting to chalk this up as a learning experience, and I guess it was, but mostly I'll remember foolish unnecessary risks. We got over it, and started heading back. Climbing the wrong peak took longer than we thought, and at least some of the cool, shaded parts of the trail were fun to run in late Autumn. We ran across another party, looking for the lake -- at 3pm, they were ~4 miles from the lake ??? -- and at least it felt a little better to bust out the map and show them where they were. Finally, we met up with Sean, and were glad to see that nothing messed with our gear. On the way back, we quickly checked out Zapata Falls itself, which is a destination for many but just a 10-minute diversion after our other adventures. We made it back to the car, which was also undisturbed, and I was happy to sit down for the ride back -- since it was still incredibly painful for me to stand up after sitting down. We figured we'd stop in the Springs for dinner, and I'd read good things about pizza and beer at "Il Vicino," so we sought it out. That ended up being a great decision, as the pizza and beer were awesome, plentiful, and affordable. To make a long story short, we'll be back there again. When the sun sets, and before it has risen cleanly, the temperature is downright cold. Ladies of a certain age take this opportunity to layer themselves in elaborate scarves, hats, shawls, and jewelry; while the men, or at least this one, choose a baser course: chile. By putting a fire in the belly, one can continue to stroll New Mexican alleys morning and night in perfect comfort. OK, besides chile, another way to put fire in the belly is through copious amounts of wine: part of the fun of visiting northern New Mexico is to visit Trader Joe's and stock up on 3-buck chuck. This year, we also made it a goal to visit the Albuquerque Balloon Fiesta. Jessica has been wanting to visit this for the past several years, but manana manana manana...Time's a wasting, let's head down to the A-B-Q. Leaving early afternoon, dreaming of southwestern food, we made it about an hour before pulling off for Wahoo's in Denver. Good ol' Wahoo's, but it cost us: a $25 parking ticket for having a foot or so of my car in front of the meter. Ah, the delights of the big city. Again we were off for Albuquerque, eventually arriving around 9:30 or so. Just a few miles north of our hotel, we spotted a strip mall Chama Brewing Co, and stopped in for a bit, quite pleased with the flickering fireplace and trickling fountain near the entrance, a friendly staff, and a delicious pumpkin spice ale on tap. Satisfied, we made it down to the hotel...almost: picked up some Dunkin Donuts donut holes first and some coffee in the thermos for the next morning. The next morning was to begin at 5am, so we could make it to the park 'n ride and eventually the fiesta grounds by 6:30 or so. Although we had extra donut holes in hand, it turns out this Days Inn near I-25 and I-40 was kind enough to begin breakfast at 4am. MMM, frosted flakes and waffle, together at last. Soon we were in line at Cliff's amusement park for the ride to the fiesta. As expected, the area was abuzz with folks trying to get there, and the park 'n ride was definitely the way to go. The grounds themselves were alighted with various vendors of various burritos, and it just got better from there. Dunkin Donuts, yes, was in the house, and other memorabilia and things for the kids. We headed to the middle field, at the end of dawn patrol, and watched a few balloons start taking off toward the moon. And then, the "Mass Ascension" began. For about an hour, the grounds were a stimulation-fest of color and motion. We raced around, staring and taking pictures, getting as close to the balloons as possible. What a refreshing return to pre-9/11 -- without rules and paranoia -- to a time when we were, maybe, 9 or 11 years old, when the world still had magic. This is said to be one of the most photographed events in the world, but like most things, the pictures don't do justice to the feeling of craning your neck straight up, twirling around, and seeing all the colours. There is also no shortage of novelty balloons, often competing for "fan favourite." Announcers provide play-by-play description of the balloons as they're taking off, similar to the Macy's Parade. After a few hours, as the sun finally started warming us, it was time to head back. Let me not mince words: Every child, and every parent, every childless parent and parentless child, child at heart and heartless alike, should go see this event at least once. Mt. Rushmore and Disney-whatever are far down on my list for kids, but this is near the top. So long, Albuquerque! It's off to Santa Fe and Taos. We can never decide which one we like more, so why not hit both? First, we stop in Santa Fe just in time for breakfast at Tia Sophia's. We haven't been there in 3 or 4 years, but the huevos, blue corn tortillas, and chile are worth the inevitable weekend wait. Jessica finds "bead heaven" next door anyway, and has enough baubles to keep her busy in the coming months. We stroll around some more, fairly leisurely, before hitting Trader Joe's on the way out of town. Several cases of wine later....we're off to Taos, where the Dona Luz Inn B&B is waiting for us. By mid-afternoon, we meet Paco at the B&B, store our things in the room, and head off to town. Again, we stroll around fairly aimlessly -- the only specific store I can think of is the bookstore, which always has a cat that needs scratching -- yes! there she is, sleeping upon a shelf. Before the sun drops too low, we grab some drinks outside. An old woman and a younger man are chatting nearby -- she doing most of the talking, as she not-so-surreptitiously smokes a cigarette, while describing various aspects of her past life across the world. Who could she be? An Aunt thinks Jess, but why the long biography? Old French Whore says I, as Jess furrows her brow at my judgment. Am I not made in the image of my creator? Eventually, the waiter asks her to snuff out her cigarette -- "I know, I was seeing how much of it I could get before you said so." Yes, we love Orlando's, on the edge of town, we love it so much that last time a drunken driver (in New Mexico, no less!) drove straight at us in our lane, and still did not deter us. It's small and packed, yes, but we don't mind waiting outside by the fire with drinks: Santa Fe Nut Brown for him, and a "Mike-a-rita" for her -- they don't do tequila (in New Mexico, no less! ), but they mix up a Mike's instead. We had a brief conversation with a former Front-Ranger who raved about the technical mt. biking in the area, and then settled in with a couple from South Africa who were touring North America. Starting from the Arctic Circle. They had swung down from Alaska to New Mexico, where they enjoyed Taos, and were headed east to Houston (sorry! ), where they were to take a brief flight to Costa Rica (Pura Vida!) before resuming a swath across the American south. With limited experience, we told him about our voyage along the World's Longest Yard Sale; his eyes lit up, as he was looking for the authentic, deep south, little diners and all. While we can't speak for Mississippi, we put in a good word for Alabama and Tennessee backroads. "Don't waste too much time in Atlanta," I suggested, "but spend some time in Charleston for sure." As we talked, our seething envy must have been obvious, as he politely suggested that we lobby Obama for more vacation time for citizens. Amen. At least some people are able to see and enjoy all of this great land, even if the folks that live here can't, won't, or simply don't. Our number was up, dinner at last, where I will skip the intimate details, except to say that not a single shrimp, pizole, or pinto bean survived on either of our plates. We retired in comfort to the B&B, where I enjoyed keeping a wood fire burning all night in the kiva. Breakfast in the morning was a surprisingly simple affair of boiled eggs, yogurt, toast, etc. Filling, and it does make the B&B cheaper, I suppose, but doesn't fare well for ranking of the second B in B&B. Onward and upward, for a hike to William's Lake! William's Lake is a popular hike at the top of the Taos Ski Road. We've enjoyed it up there in the winter, so decided to check it out in the Fall. Some of the aspen in the area were still clinging to golden leaves, and a few skinny-tire enthusiasts were out enjoying it. Soon, we were up on dirt roads past the Ski Area, to the trailhead. The hike is an easy and popular couple miles through the forest, up to a cirque, with the lake resting in the shadow of Wheeler Peak, the highest point in New Mexico. We hadn't ruled out tagging Wheeler as well, but decided to play it by ear. We saw a manageable handful of folks enjoying the day, but were slowed by some ice and snow on the trail, a little more than expected. We carefully picked our way up, where the view and the wind opened up abruptly. Stop at the Bavarian Lodge at the base for lunch? We had been there before during a ski day and enjoyed soup by the fireplace inside. Today, we opted for the sunny Sunday sundeck, and two surprisingly delicious, sausage-like veggie burgers. Full on a German double bock, we doubled back down the mountain, where I made it about 4 miles down, before a nap hit me head on. I looked at Jess, seeing if she minded pulling over or driving. Was she snoring? 25 minutes of napping in the car, my vigor was renewed...enough to make it a few more miles down to Arroyo Seco, a cute little pueblo with a few artsy shops and Taos Cow. Mmm, ice cream and sunshine, and I seem to recall the coffee being good. Turns out, I drained the pot with my trusty Thermos, and they gave it to me free. Sweet. Out of guilt, I had to buy (and devour) a small cone of Cherry Ristra. I wasn't even sure what was in Cherry Ristra -- would it be spicy? -- but they had me at the name, and it turns out it had chocolate in it, too. Now, satiated for a few more minutes (I only had a dollar left in my pocket, anyway), why not tack on a side trip to the Rio Grande Gorge Bridge, only 7 miles from the intersection at the ski road? Turns out, it's just about as overrated as we thought it was. Meh. A native was soliciting money as his car broke down and was getting towed, so I gave him my last buck. We doubled back and headed north, treated to a face full of fourteeners as we hit Fort Garland, and then headed home. This year's aspen showing seemed a bit down from previous years. Admittedly, we were out of town during the peak for much of the state. Still, yesterday's drive through the Poudre Canyon showed that peak was definitely passed, but there were still some spectacular stands remaining. We love the Pingree Park area, but hadn't explored Buckhorn very much. The only time I'd been up 44H itself, in fact, was almost a year ago, when Caleb and I did a brief scouting of Moody Hill on Thanksgiving Day. From then, it was clear that this area had more potential. I had, though, done some rides on Old Flowers, and heard that Steve and some boyz hit up White Pine a few weeks ago. This by itself sounded like a good mellow hike for today. Looking out the window at 7AM, there was a solid line of clouds sweeping across the foothills, north to south, but there was an interesting gap just behind them. With luck, we would hit some good weather back there. We took our time getting ready -- the only threat this time of year is rain and cold, but at least not lightning -- and got to the ranger station around 9.
and we headed back down, again taking our time and enjoying the leafy road and some of the still brilliant aspen. We also checked out the trail leading directly north of the white pine saddle, which eventually connects to Old Flowers. This singletrack looked clean and awesome as it rolled over a bed of pine needles, and there were some nice campsites offset from the road. Definitely worth a future visit! Near the bottom, there is one intriguing, large boulder just off the side of the trail, that I spotted on the way up. Not being in a hurry, I played around on it. It was quite solid and fun to practice on, but I still have a hard time downclimbing. Need to practice that more. Interestingly, I descended on an easier, slightly mre reddish rock next to it, which ended up being more flaky. I'll have to ask Caleb what's up with that. We made it back down and saw a few more folks headed up, but all in all a nice stroll in the woods. The road isn't too rocky, so it might be worth a future ski visit. Before we left, we looked at the trailhead for Donner Pass. This trail has always intrigued me: first, based on the name, but also because it's not overly popular. There's definitely more stuff to check out in this area! 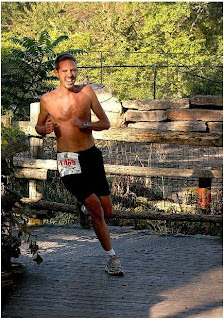 While I was having a self-induced rough day at work on Friday, my friend Ben had just texted about a solid run he had just finished in his Raramuri sandals. I looked outside: it was a perfectly cloudless Fall day, near sunset, and I still hadn't gotten outside to run. Jess was recovering from a tough week at work herself (which culminated in fantastic presentations from Dr. Ratey on the exercise/brain link), and I was still at work, so it was clear we were going to be in town for the weekend. I called up Ben with a half-baked plan to see if he had any plans for sometime before dawn. He was already planning a full-moon hike on Sunday night at Horsetooth, and already meeting friends in Denver on Saturday afternoon, but that didn't answer the immediate question: was he up for some sort of full moon/sunrise hike above treeline, somewhere? As the answer was "Yes," we discussed alternatives, eventually settling on Cameron Pass. Initially, we planned on Mt. Mahler, but after thinking about scrambling up a north-facing aspect that neither of us had been on before, with a possible dusting of snow in the dark, we decided against it, and opted instead for some exploration of Montgomery Pass/Diamond Peaks area. So I picked Ben up around 4AM, and we headed out. We had a bit of a snafu with finding a gas station that accepted credit cards at that hour -- who knew? -- but then we were off, driving west through the silent canyon with the moon still above us. Just before 6, we were at the trailhead, with a very faint dawn and 28 degrees. Actually, the snow was surprisingly fresh and still in the trees. One more decent snowfall, and a fun October tour in the trees could be had. We made our way up between the North Diamond and Montgomery Pass, cautiously traversing the steeper angles, until reaching a drier pile of summit rocks. As we suspect, the west-facing aspects were windblown and easier to walk on. And run on, so we did a bit of trail running on the ridge, past Montgomery Pass and over the next few summits. Overall, the entire ridge line in this area never ceases to amaze me with it's fantastic above-treeline views and fun, easy running or hiking. Some day in the summer, I'd like to start from the South Diamond and continue north towards Clark Peak. I'm not sure how gnarly it gets in that direction, but it's intoxicating having such a long stretch above treeline.